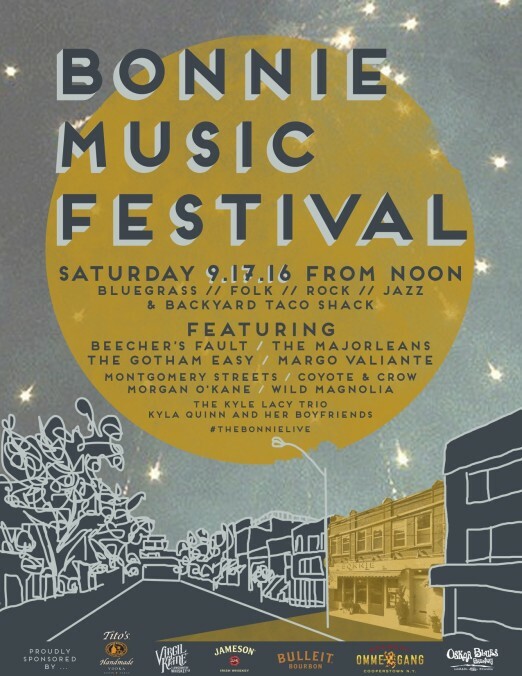 The Bonnie Music Festival Debuts September 17! Summer has come to to a close, which means fall is on its way. While we love the sunny season, autumn in Astoria is pretty awesome too. It’s a time for watching football at our local sports bars, pumpkin being added to everything, and major fall shopping trips to Lockwood and The Brass Owl. And this year, The Bonnie is giving us an even bigger reason to be excited for the change in season: they’ll be hosting their first fall Music Festival, to be held September 17! This free event, kicking off at noon, will be a great day of eclectic live music, fantastic drinks, and TACOS. That’s right: Tacos will be grilled to order, including: skirt steak with burnt onion chimichurri, BBQ pork with habanero-pineapple glaze, and for the vegetarians among us, smoked tofu and sweet potato with pistachio mole. As we mentioned, admission is free. Tacos and drinks will be for sale via a carnival-style ticket system: one ticket will get you a taco, two tickets will be good for a cocktail, etc. We can’t wait to welcome fall with this event. See you there!